The new 3 burner Chile Grande is our longest, most powerful forge. Built with production in mind, this forge features 8 inch wide by 5 inch high openings on both ends. Powered by 3 of our Diablo Burners, this forge's performance rivals others with 5 burners! lightweight and will not draw heat from the forge chamber. Features heavy duty adjustable stock support. Forge Interior Fully lined with two inches of ceramic blanket. Forge floor is made of ceramic, providing superior strength and durablity. The forge interior is coated with ITC-100 refractory, which	increases the forge's fuel efficiency up to 30%. 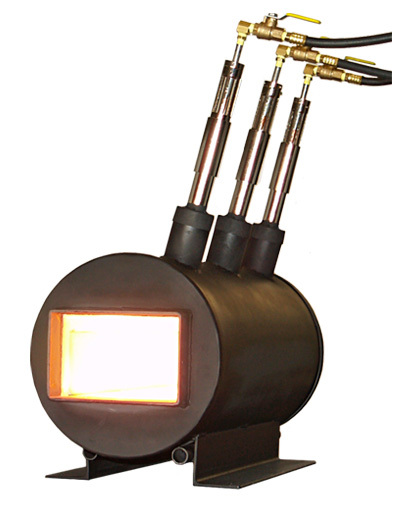 Diablo Burner1 Powerful and efficient, this burner is pre-tuned to develop a neutral flame leaving little oxygen for scaling. Each burner has individual ball valves for maximum eficiency. Operating pressure range from 3 - 15 PSI. Set-up, operation & maintenance instructions with every forge. All forges are cured, tested and 100% guaranteed. or use our "Shipping Quote" service. 2 100lb tanks or larger recommended for optimal performance.